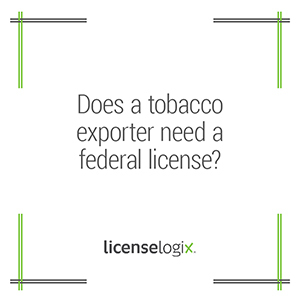 If your company intends to store exported tobacco products within the United States, you may be required to obtain a federal permit. The Tobacco Export Warehouse Proprietor permit is required for all businesses that intend to warehouse tobacco products for export without payment of tax, or with drawback of tax. The license is issued through the Alcohol and Tobacco Tax and Trade Bureau (TTB). In order to apply for the permit, you must complete a detailed application, a personnel questionnaire for each officer, director, or stockholder of more than 10 percent, and obtain a surety bond. U.S. Customs Service does not generally require an import/export license to trade goods internationally. However, specific products, such as plants, are listed as restricted items for purposes of international export. Therefore, obtaining an import/export license from the relevant government agency is essential for maintaining legal compliance only if you intend to export tobacco as a raw material. It is recommended that tobacco exporters preemptively contact the embassy or consulate in the host country with which you intend to trade in order to understand the requisites of the receiving country. Many foreign governments do require verification of U.S. licensing as an assurance that products being brought and sold in their countries are suitable to be marketed within the U.S. and that the companies with whom they are doing business are legitimate. Thus, it is important that tobacco exporters consult with the importing country to determine exactly what type of information is required.